Winter’s brief appearance and disappearance, rabbits arrive, raising beds (or not), aerating compost with a metal corkscrew, root veg for winter abundance, more on potting composts and peat alternatives, whether to sow now or wait a little longer, midwinter growth of salads undercover and outdoors, pruning chilli plants to keep them growing next year. Until January 13th this winter’s warmth saw temperatures an unreal 5C above average here, since late November, bringing things on a bit fast; so I was grateful that we had -7C here on 20th. Plants will benefit: blackcurrants for example need cold to initiate fruiting, and slugs risk being rampant in spring if we have no more frosts below about -6C. 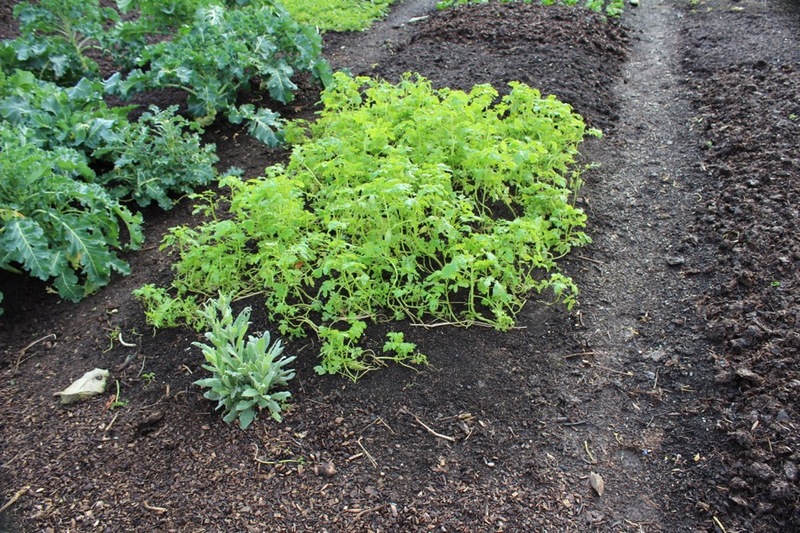 Cool conditions are better for storing root vegetables: currently they are sprouting in their boxes, except for celeriac which keeps so well. Also I am impressed with Charlotte potatoes, still firm and with few sprouts, simply in paper sacks in the shed, from a July harvest. 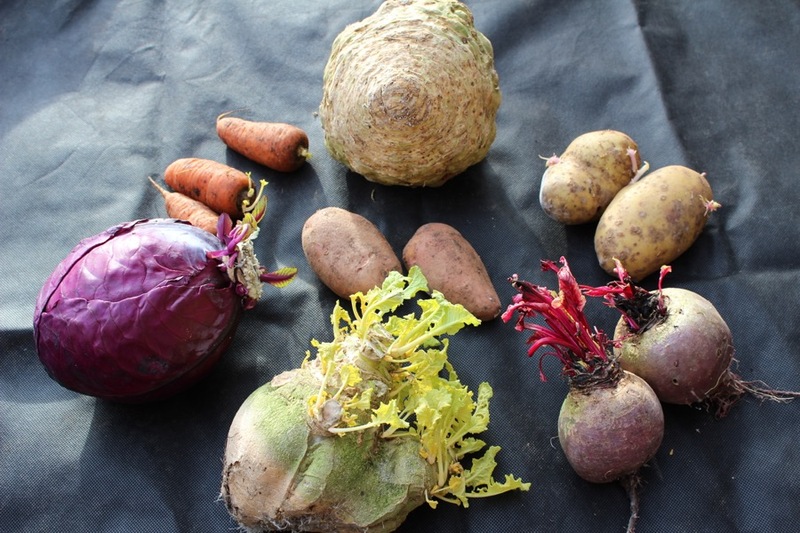 I brought these root veg out of the shed on January 12th: swede and beets are the most sprouting. Sarpo potatoes in the middle. Organic veg store well! 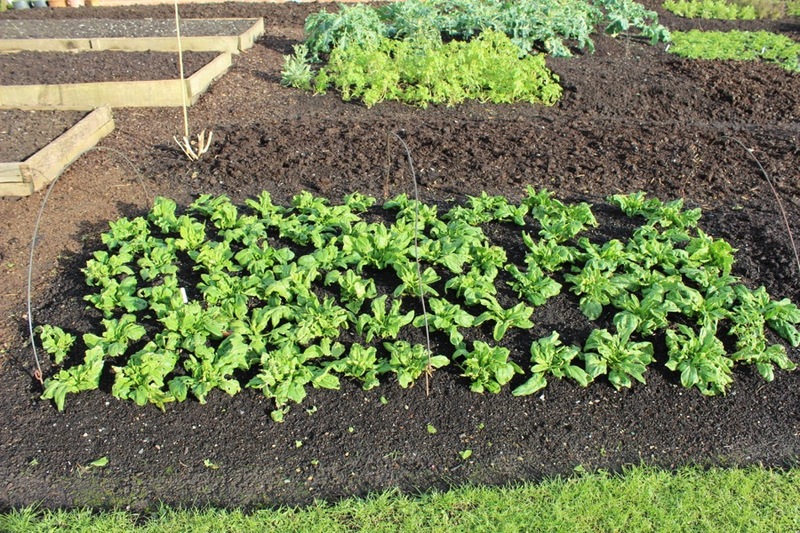 Spinach Medania was sown 8.8, planted 30.8 and has been picked since October, so abundant and the leaves are currently extra sweet. It should crop until June. As winter progresses, wild animals and birds grow hungrier. 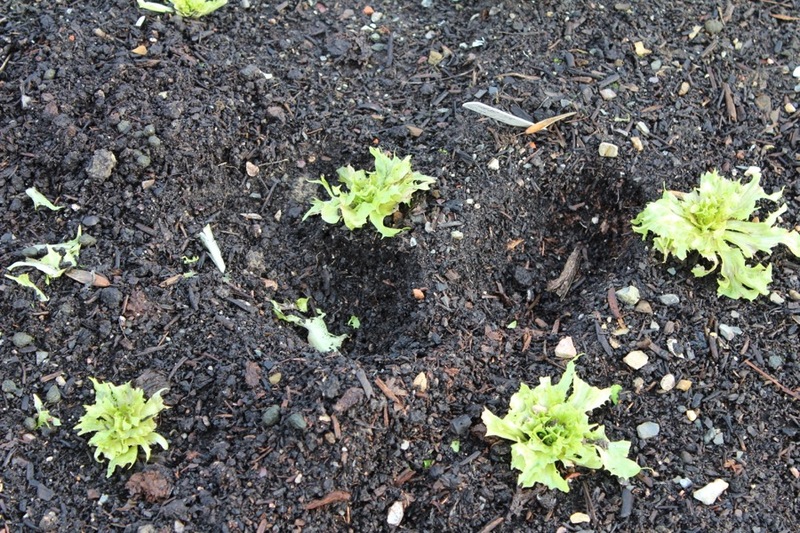 Homemakers has rabbits, which mostly eat my grass and clover in summer, but recently they have been tucking into endive, parsley, some spinach and mustards. 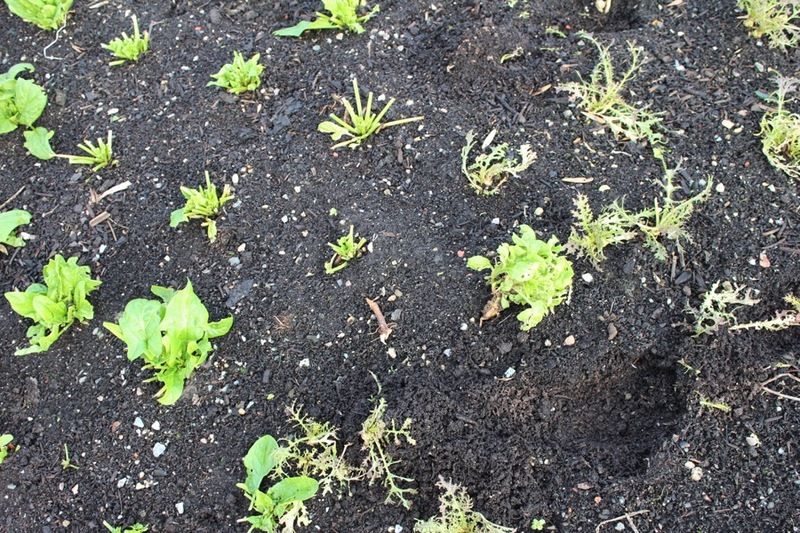 I have not yet covered my main spinach bed with fleece and am happy to let them clear up some other odds and ends. Against pigeons. netting needs to be on a frame that holds it above plants, otherwise the birds sit on it gratefully and peck through. On the other hand mesh can be draped on top of plants. 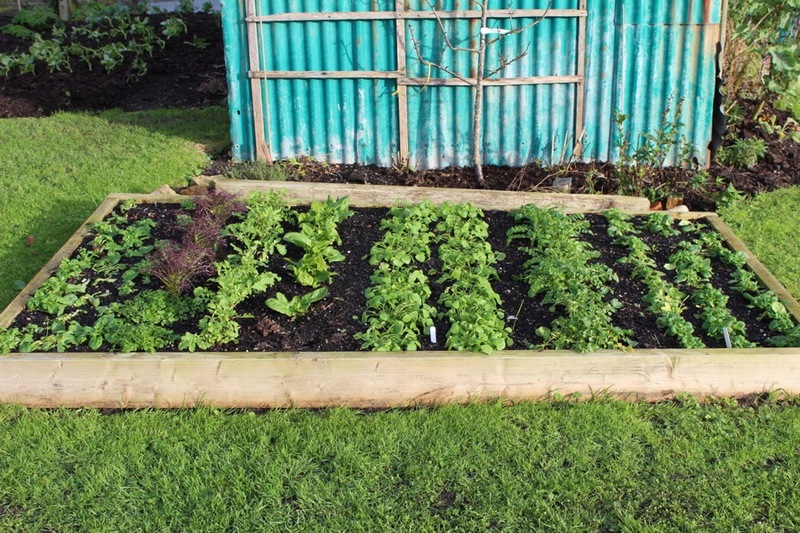 How raised is a raised bed? Mine are mostly without sides and are about 3in (7cm) higher than the paths on either side. Some are a little more raised, because when creating them I put 2-4in soil down as the first ingredient at the bottom, when making the bed. Soil holds its shape, compared to compost which shrinks to very small volume over time. 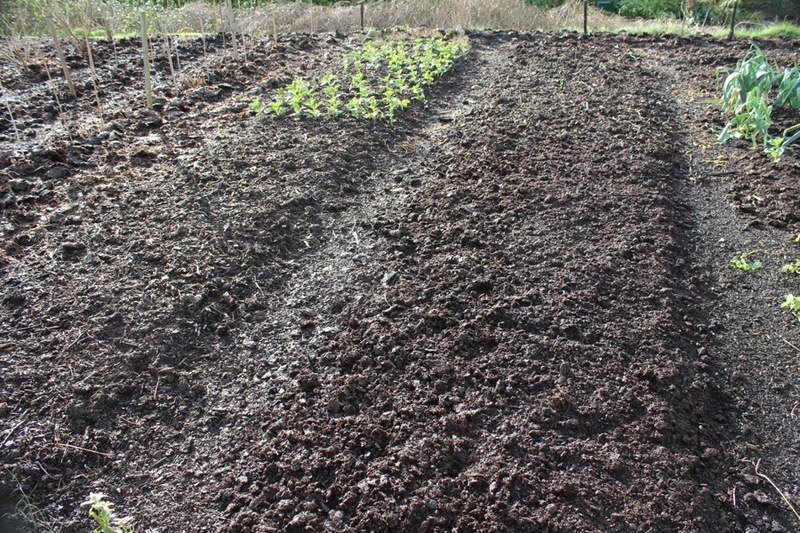 In the middle of Homeacres is a damp area where moisture sits longer and I am raising two beds there by scraping 2-3in compost off the top and into a large barrow, then barrowing 3in soil onto the exposed area, then replacing the compost. I was prompted to this by an unexpected gift of topsoil from a neighbour who was dismantling some raised beds. So now in wet weather, these beds will be better drained. But in most of the garden I am happy with flatter beds. 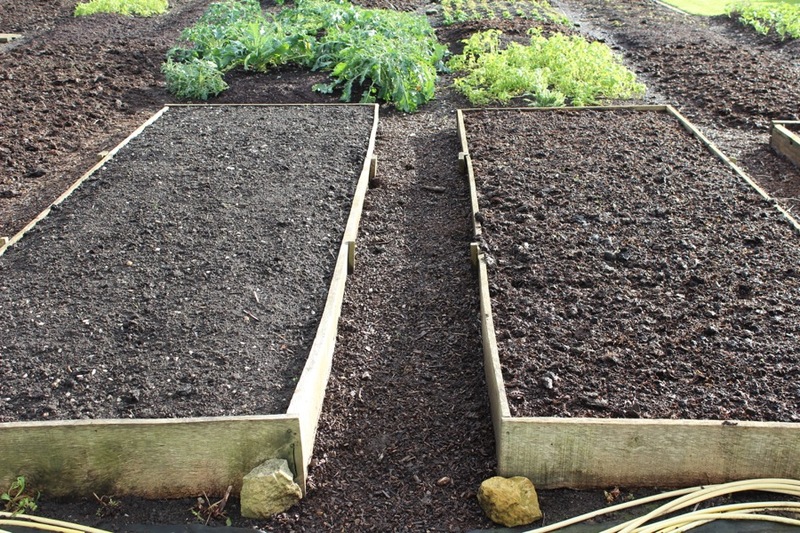 These beds of November-sown garlic and broad beans have 2in soil under the compost. The garlic is forward for January, so far so good. I just spent £20 on a compost aerator! Its simply a long metal pole, stainless steel, with a corkscrew at the bottom. A neat idea with nothing to break, and its effective, but expensive for what it is. I urge any engineer reading this to consider making and marketing a similar device. The idea is you screw it down to the bottom of a heap, then pull (needs muscle!) to bring the less aerated compost at bottom to the surface. It takes 5 minutes of so to work through a 4x4ft heap, and is less thorough than turning, but simpler and less messy. 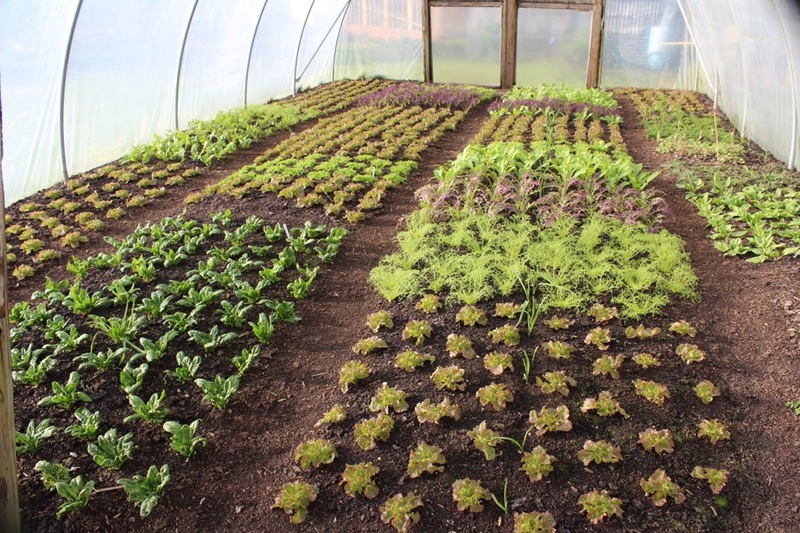 The bed of salad below was filled with compost last May and has cropped continuously since then, we filmed making it for the online course. Using it to lift compost from the bottom. Rat was unhappy. Ulloco is another new veg to try, see incredible vegetables for information and to buy some if interested, they sell oca too. I am having a go at ulloco but am not growing mashua again, despite its tasty leaves, because the tubers are really not delicious. My favourite so far of the unusual veg is yacon and its storing well. 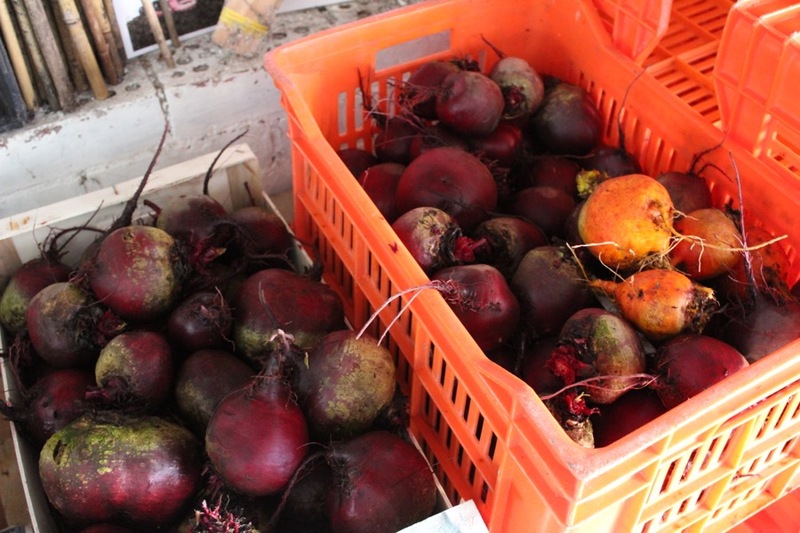 In terms of yield, its hard to beat old favourites such as beetroot – a January harvest here gave 36kg from 7 square metres, and that was a second crop after garlic. I never weeded it except to tweak the odd one in passing, so easy. Why dig? 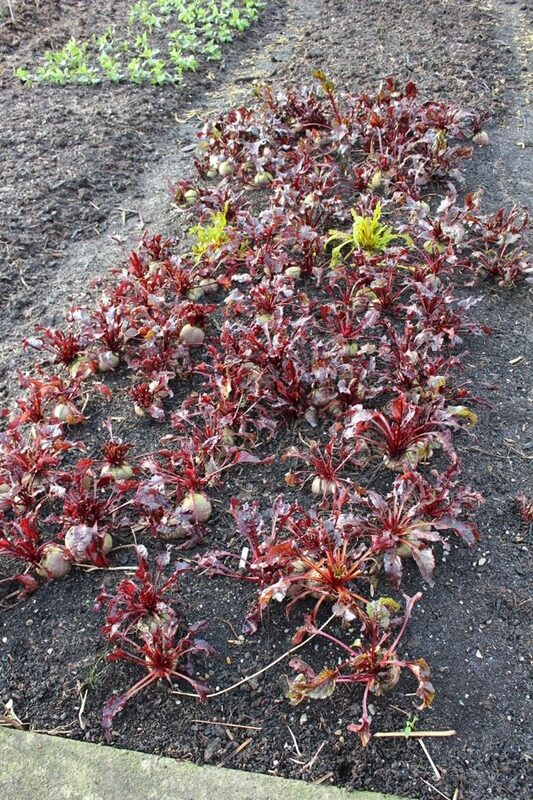 Beetroot Jannis and Nova were sown in June, planted July after garlic, here at harvest Jan. 11th. 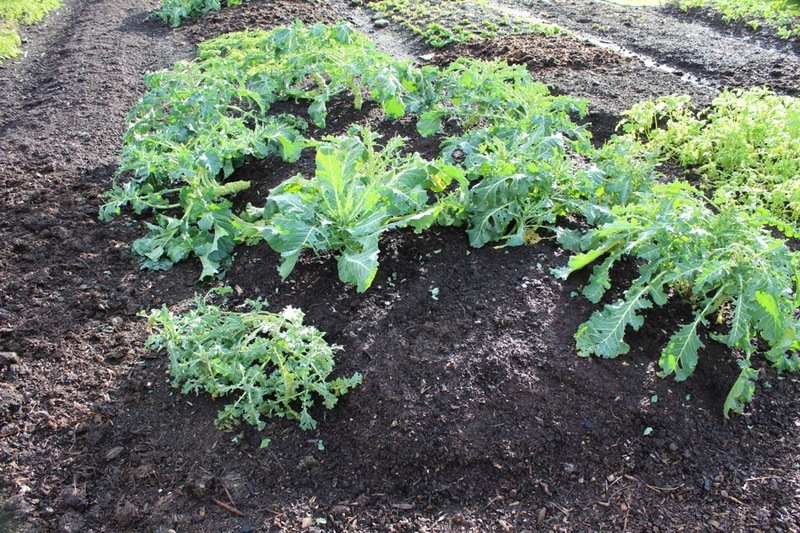 A subscriber asked why some of the composts I recommend contain peat, and the reason is because I want readers to succeed with their plant raising and not have their crops spoiled by poor growth. 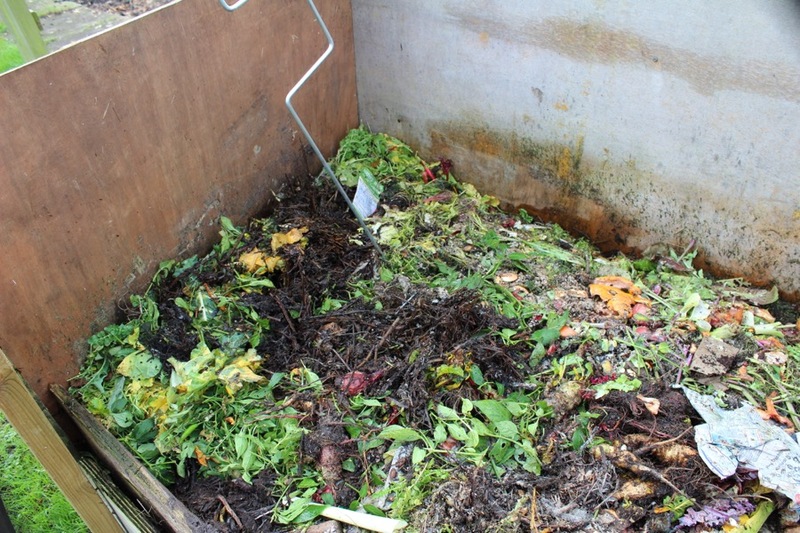 There are still many nutrient-deficient or imbalanced composts on sale, based on green waste of different kinds. 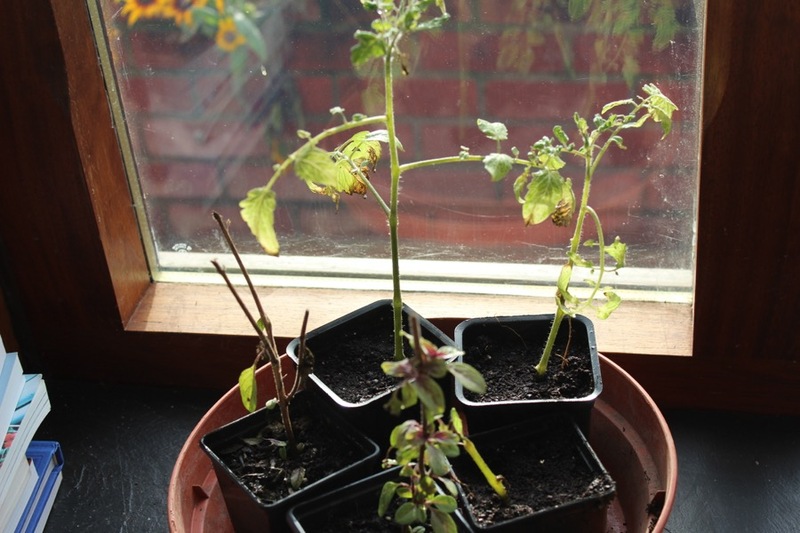 For example I lost plants last year to an Arthur Bowers peat-free multipurpose. Its high content of carbon (from wood waste) caused high levels of chloride which then sucked out the nitrogen before plant roots could access it. See Which? 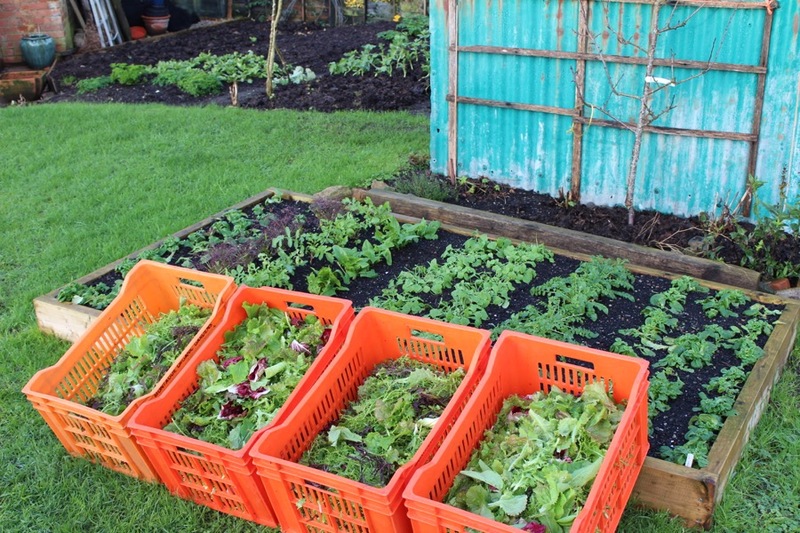 Gardening Jan/Feb 2016. 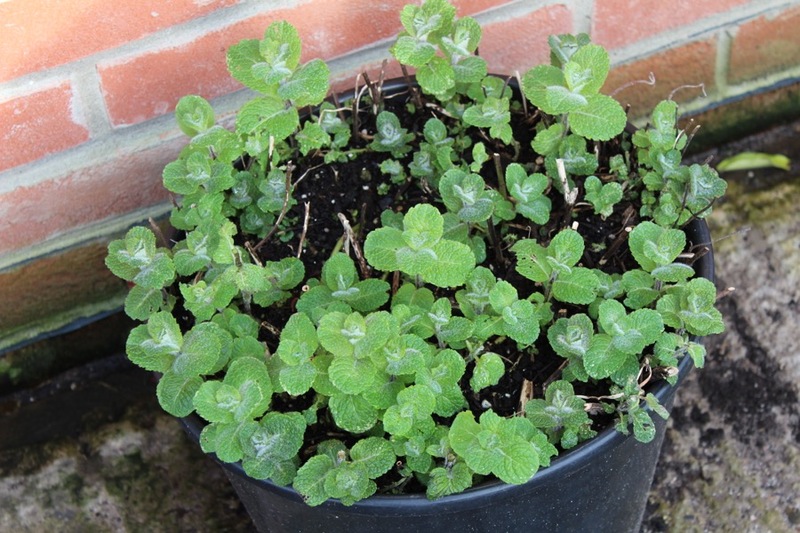 In 2013 I had a phone call from a despairing nurseryman who had been advised to use green waste compost for his five acres of primula plants in pots because they were all going yellow, and liquid feeds were not helping. He had been wrongly advised about the compost he was using. Three years on, the current Melcourt non-peat mix is a best buy (used by Nat Trust), though not widely available. The West Riding compost I use is now half green waste, and half peat which has been sieved out of reservoirs by Yorkshire Water. The peat is a waste product and West Riding compost add mysterious goodies to create a product which has grown great plants for many years. It is Soil Association standard too. Not everyone can buy it because the retail sack price is high, although a pallet of 60 sacks costs around £6/sack for 40 litres. 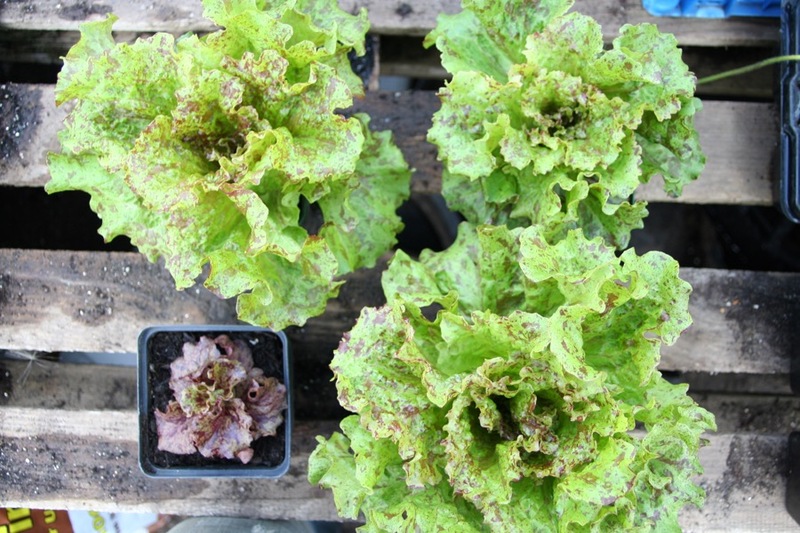 Ten weeks from planting the lettuce and some nitrogen is becoming available to the lettuce bottom left. Top right is homemade compost. Continue to wait before sowing the first seeds, until mid February. 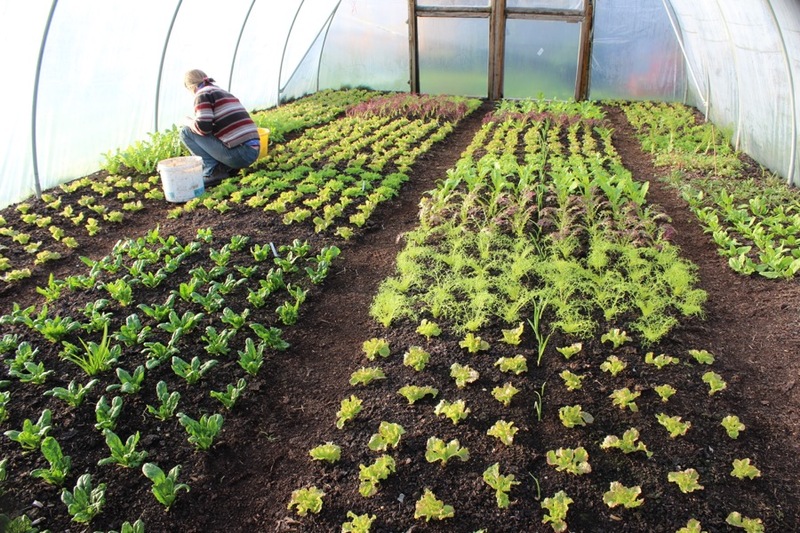 My first sowings will be lettuce, spinach, onion and spring onion, cabbage, cauliflower and calabrese – all undercover and for planting late March to early April. In northern Britain you could sow all these a little later in early March. Choosing which tomato varieties can be confusing when there are so many. Nicky Kyle in Ireland has compiled a useful report and I plan to try a couple I don’t know. 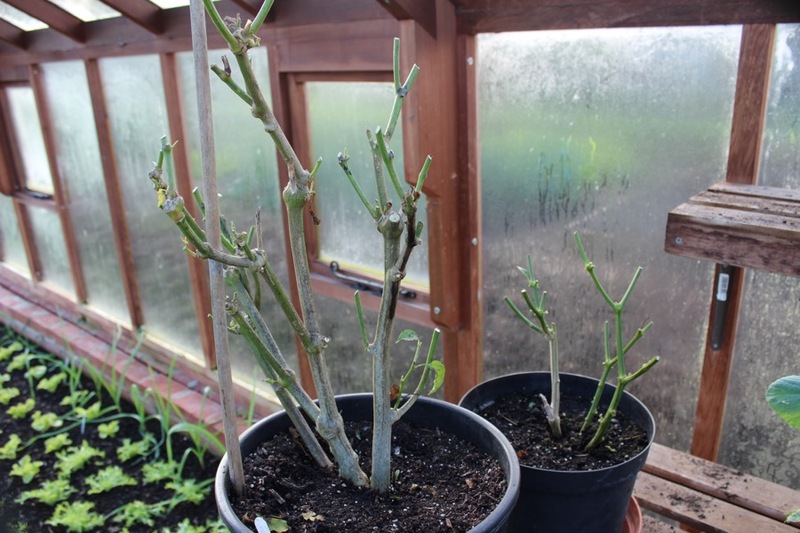 Sadly Rosada is not currently available and I am hoping my side-shoots survive, although they were frosted in November in the greenhouse. 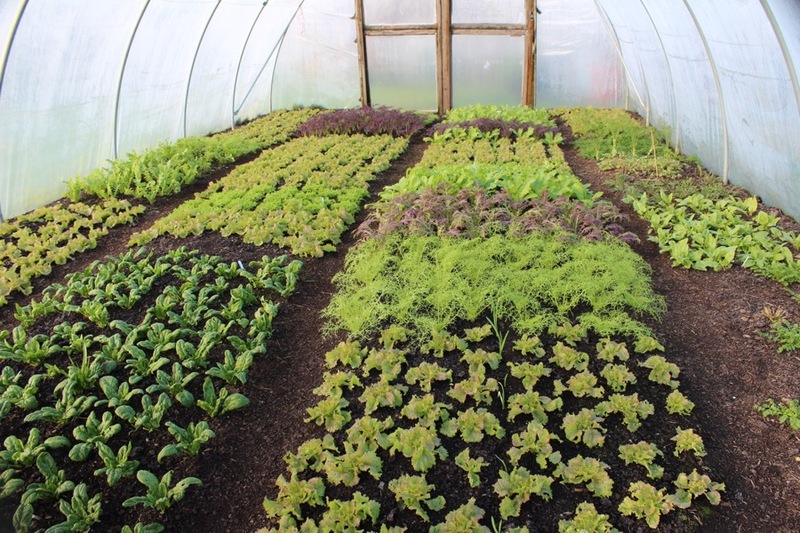 Growth has been good and we just picked over all plants in the greenhouse and polytunnel, giving a harvest of 12kg. 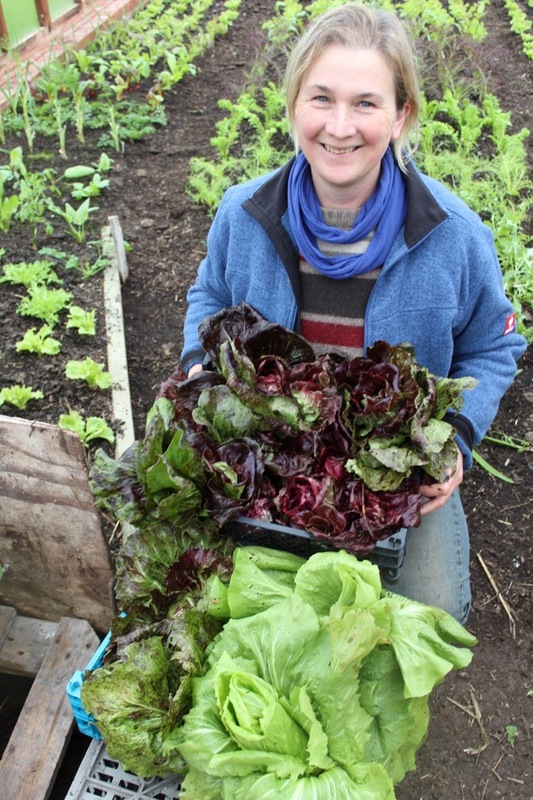 This included a few of Steph’s outdoor chicory hearts and its the most I ever packed at this time of year. 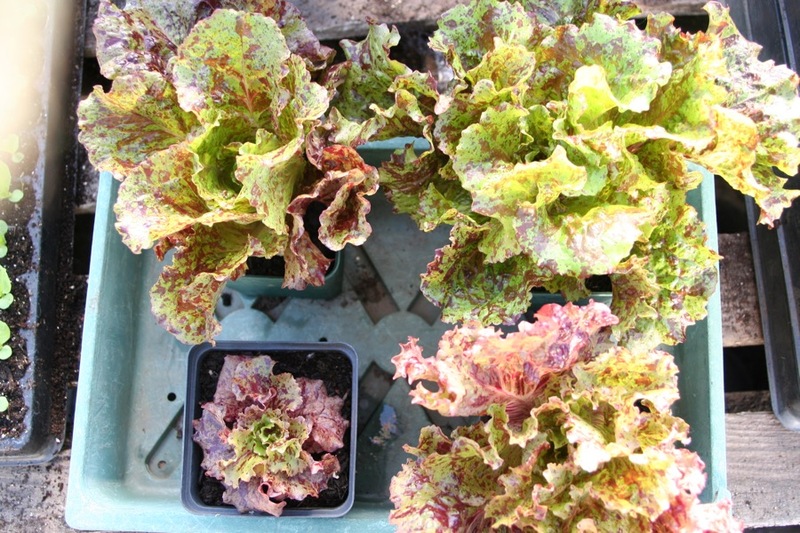 Growth is slower now in the less mild weather but soon there will be longer days to encourage plants again. 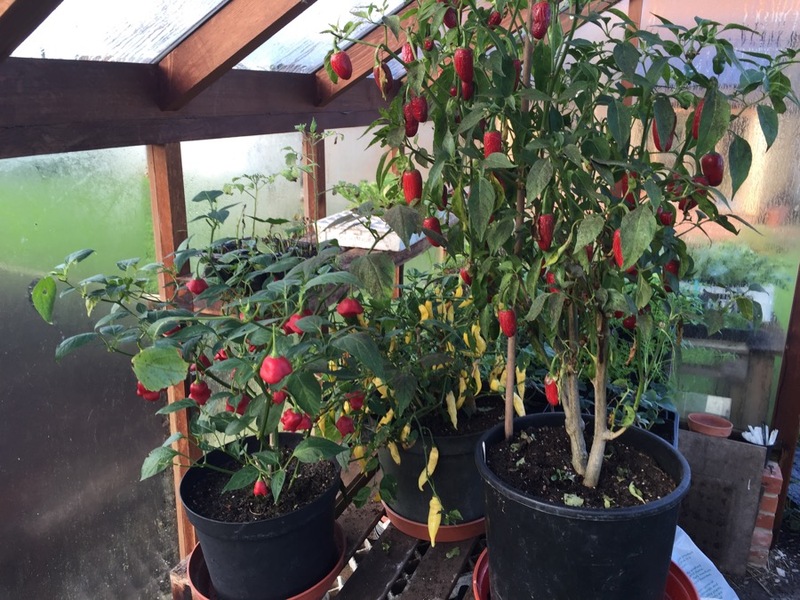 If your chilli plants are still alive, you can make a final harvest (leaving fruits somewhere dry for later use) and then prune plants as in my photos. Simply keep them frost free and with slightly moist compost. In May I bring them from the indoor windowsill to my polytunnel, and the three year old Jalapeño is now pretty large. In my newsletter I have been sending some logo ideas and here are two from Sarah Davenport in Brighton. Many folk have pointed out that “Less weeds” is not good grammar! however it has a nice ring. Common advice is to keep a logo simple: one colour and with few words, so this breaks a few rules. I am happy to hear any feedback. Love the logo on the right, positive words make such a difference. Continuing the positive theme, what about having the row of carrots in the centre of the logo and shape the shovels for the bottom, but I’m not sure how that would fit . Looks good overall. Yes and maybe leave the shovels out? Steph reckons they are skull and crossbones. Yes, wasn’t sure about the shovels since it’s meant to be about no shovels! Maybe move the more growth words about the carrots. I agree re. the shovels – when I first saw them, I thought of skull and crossbones. This is a difficult idea for a logo. I think the simpler, the better. 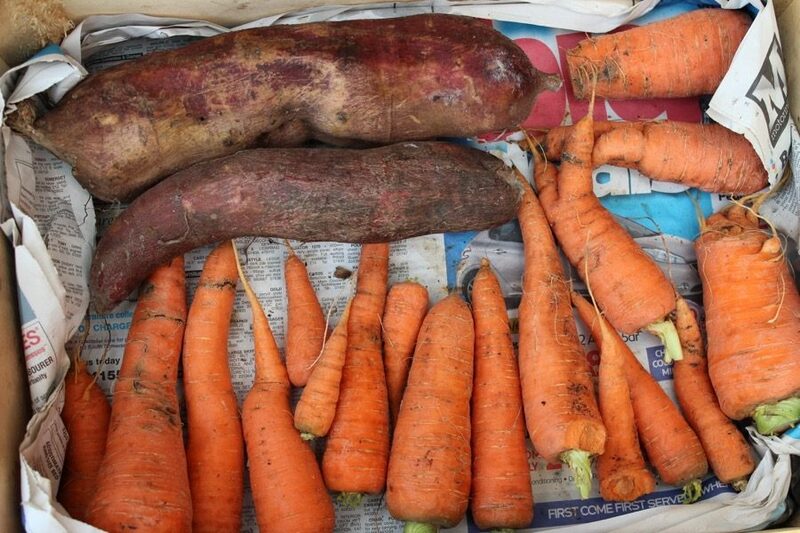 I would suggest leaving out the carrots as well as they add fuss and possibly confuse the idea (carrots not the only plant to benefit from ‘no dig’). The text “Save time, fewer weeds, more growth” I think do not fit with the idea of a logo – one looks for simplicity and quick recognition which are achieved by establishing a pattern with an element of repetition/symmetry(a balanced pattern not equality). This is not easy. I’ve been thinking about it but not enough – too many other demands on my time, I’m afraid but I’ll come back if something surfaces from the porridge. On the compost aerator – I bought a very strong one designed for making holes for fence posts, but it is also v. good with the compost heap. V. cheap (for France) about 20 e (including delivery). Hi Charles, another nice update from you. (I am not connected in any way to them). What about two colours? Green is obvious but how about Copper orange in place of the white (hmm, just thought, White is a colour!). Kind of subtle nod to Copper tools, which as you know are excellent. Gammer, wot granma? Love your blog. Always so interesting and useful. Like the logos. Think wording on right better. I too love the logo on the right.The 3 phrases,Save time,Fewer weeds and More growth accurately describe the benefits of No Dig. I prefer the logo on the right, as it is more accurate. A darker colour of green may make the wording stand out more. Lastly, I think the wording would look stronger in bold print, same type print as NO DIG, just smaller. I do not know where and how you would be using your logo, but if embroidered or printed in a smaller form the ‘written’ type possibly could be a problem. 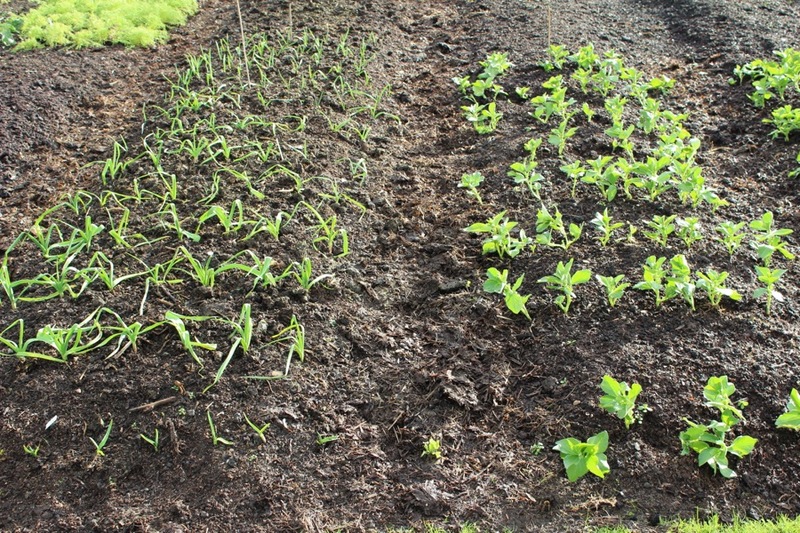 The you for all your inspirational help, my garden/veg., patch has been transformed since using NO DIG system. Good points Anne thanks, and its great to hear of your no dig happiness! Thanks for your feedback Andrew. Great to hear about your soil improving. On the whole, logo preferences are are for no spades and a simpler design, definitely with fewer weeds rather than less! I agree with others + Steph about removing the spades, however could you replace them with either a rake, a hoe or both? After all, those are the things no-diggers do tend to use on a regular basis…. 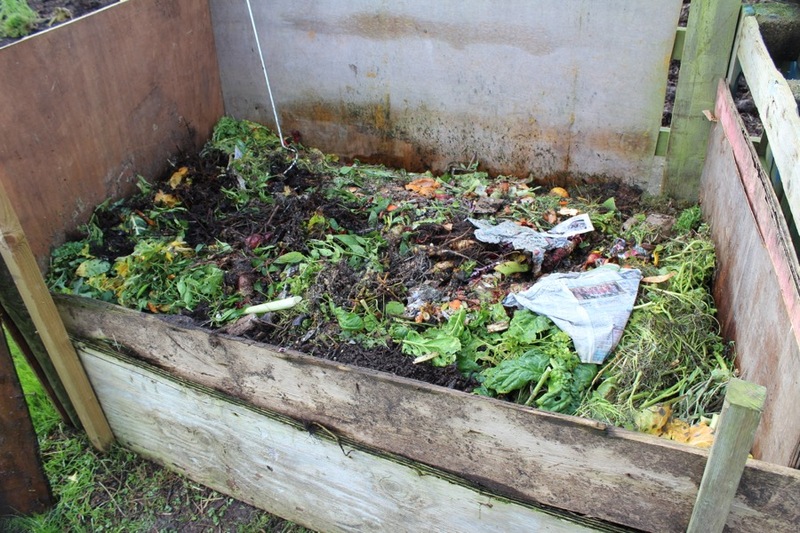 I wonder if the back colour below ‘soil level’ could be closer to that of perfect compost? A deep brown?? That would work if you moved the ‘More Growth’ above ground…..you would need to colour the carrots/parsnips to provide contrast…..
Again many thanks for the comments and I think we are nearly there, new version appearing in my blog on Monday 15th.